You can add some dummy data to check the performance of your cache. Following are the steps that are to be performed to add test data to your cache. In Cache Explorer view, right click on the cache to which the data is to be added. Click on the Statistics option in the right click context window. 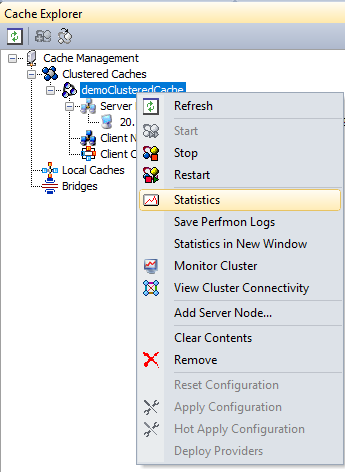 On the Statistics page, specify the number of test items to be added in the cache and click Add. 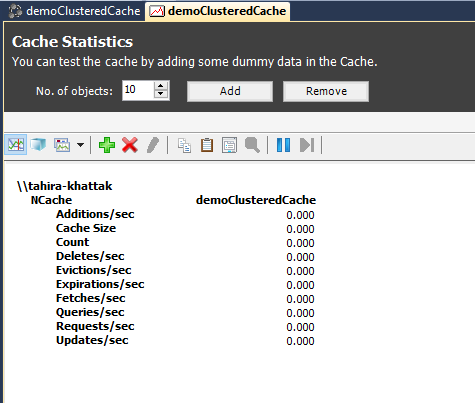 This will add dummy data of 40 objects in the demoClusteredCache. Add-TestData cmdlet enables the user to add some test data to the cache to check if the cache has started and is working properly. The following command adds test data to the cache named demoClusteredCache. It adds 40 items to the cache and the data added will expire after the time duration of 5 minutes.